I just thought these were way too cute at Maw-Maw’s house. Couldn’t wait to share them with you! 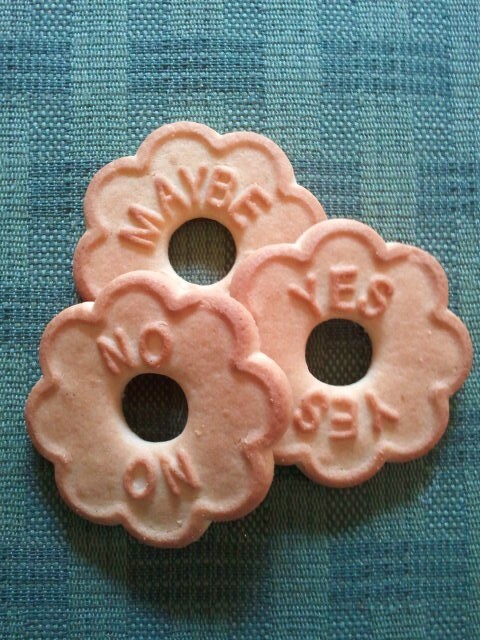 How easy would it be if we could make our life decisions out of just which cookie we pull out? Like the Magic 8-Ball for Foodies! Growing up, I loved to eat these butter cookies. Maw-Maw and Paw-Paw always had them in their home. I used to wear them around on my fingers like I was some rich girl and could afford fancy daisy-shaped rings. *smiles* Then I would stretch my finger as far away as I could from the other fingers and nibble away at the petals until I was left with an itty bitty ring. Next Post Welcome to The Onyx Plate my Forrester Photography friends!